Winter is here and what could be better than a bowl of steaming hot matzo ball soup??? 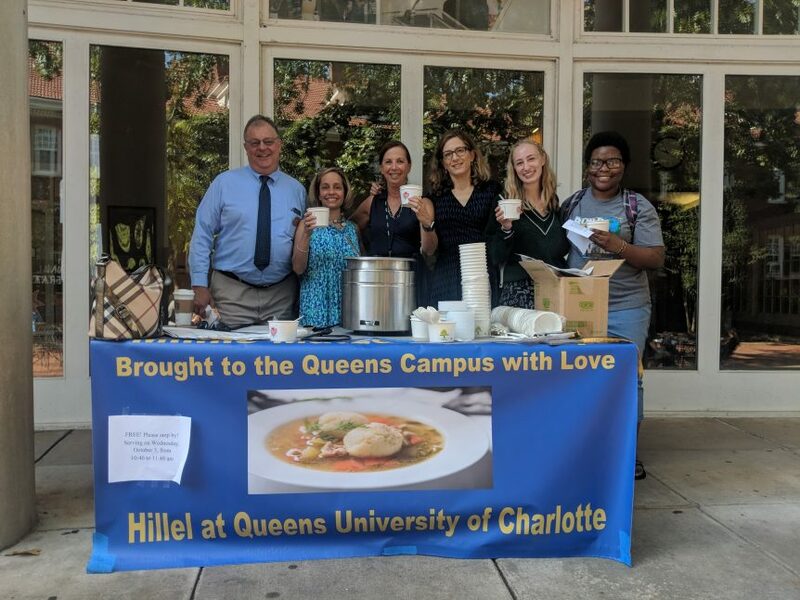 The students, faculty and staff at Queens are looking forward to the next serving of our new Queens Hillel tradition – free cups of Mimi’s Motzo Ball Soup! Our first offerings were a big hit. The soup “sold out” within the first 30 minutes, with everyone asking for more! Students who had never tasted matzo ball soup before raved about the flavor, while others reminisced about the tastes of their mothers’ recipes from their youth. A student all the way from Saudi Arabia said his mom makes it back home. One “first timer” couldn’t help herself and came back for second and third helping. The students now eagerly await our next pop-up Matzo Ball soup table. Lucky for them, it will appear again this year thanks to the generosity of the Gorelick family. The inspiration behind Mimi’s Matzo Ball Soup is Patty Karro Gorelick (lovingly called “Mimi” by her grandchildren). Patty was a lady of great taste, kindness and intellect, as well as a fashion icon and a President of Queens University’s Learning Society. Mimi cared deeply for her family and nurtured them well. She also nurtured and cared for the many communities of which she was a part. Created in her memory, the Mimi’s Matzo Ball Soup program infuses the Queens campus with the love, warmth, and wisdom that Mimi (Patty) shared with all who were fortunate enough to know her. What a great way for our Hillel students to share a piece of our Jewish culture while creating lasting positive memories of matzo ball soup for our diverse student body.